Philips Research in Germany announced on Friday that they have developed underwear that monitors your heart. The underwear can also dial 911 for you. The comfortable heart monitor uses sensors woven into the fabric. These sensors detect electrical fluctuations on the skin surface, which in turn are used to determine how rapidly the heart is beating. Activity and stress levels can also be monitored. The ultimate goal of the project is to create a product that can be used to easily monitor important aspects of health for everyone - not just those who have medical problems. 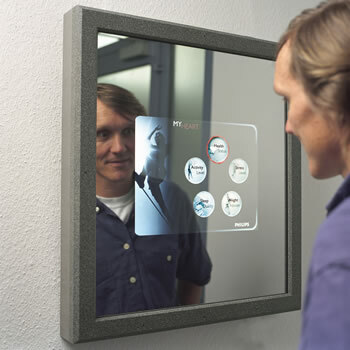 The following illustration shows a display built into a mirror; important personal health information is seen easily, in the course of your daily life. Traditional means of heart monitoring are cumbersome and tend to restrict activity, rather than encouraging it. Heart monitoring underwear could make it possible for users to lead a more active (and therefore more healthy) lifestyle. However, it is noted by researchers that the underwear must be relatively tight-fitting, to maintain contact with the skin surface. As mentioned in an earlier story (MEMSwear Fall Fashion - Bluetooth-enabled Detection Shirt) the heartshirt from Rudy Rucker's novel provides an interesting early prediction of this product from twenty years ago.